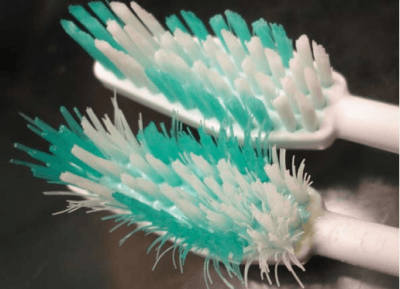 4 Gross Reasons You Should Change Your Toothbrush Now! The one thing about teeth that is really quite frightening, is that unlike other parts of your body, you don’t get a second chance. If your teeth go bad once the adult ones have grown through, then you just lose them. Due to this, taking care of your teeth is of utmost importance, and that includes making sure you have really healthy gums to go alongside them and support their health. Your toothbrush is a vital tool in this process so making sure it’s of top quality and in a decent state is important. Studies have shown that toothbrushes can be holding up to 10 million bacteria on it at any one time, so regular replacement is important to ensuring that you do not spread disease within your own mouth. However, the bacteria are not the only problem with toothbrushes long overdue for replacement. 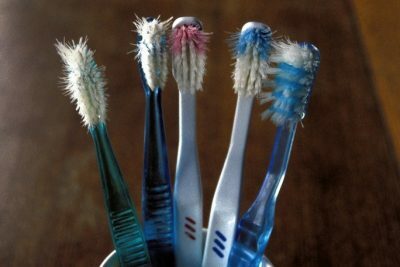 There are a plethora of reasons that you are advised to change you toothbrush every 3 months, and here are just a few. When you use your toothbrush, it experiences wear and tear. This means that the bristles can be pushed down flat and often these bristles experience miscroscopic fraying. This fraying can work like a serrated knife against the gums, causing them to cut open. This leaves a hole just waiting for some of those 10 million bacteria to swoop into. Moreover, when the bristles are flattened downward, they rub the gums causing more abrasions by only really brushing one way, but also causing microscopic bruising and ulcers. Frayed bristles may act as abrasive little needles, but they are less effective at cleaning of plaque in your mouth. With an old toothbrush, you may be doing the action of brushing but it isn’t having the effectiveness. This can lead to periodontal disease and tooth loss if the plaque build-up becomes so much that. What is the point of all that hard work brushing, when you are not really clearing away the plaque? It’s cheaper to get a new toothbrush than to have false teeth fitted! 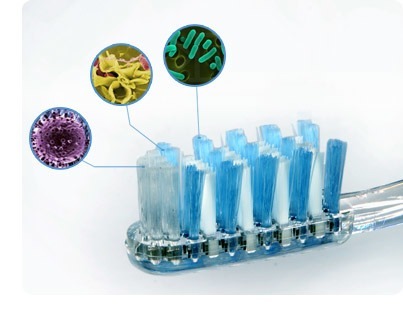 As noted above there can be up to 10 million bacteria living on the bristles of your toothbrush. This may not seem possible but when you take that toothbrush out of your mouth, you usually only rinse it, which hardly cleans it at all. Furthermore, toothbrushes are usually stored in an open-air environment. Therefore it is integral to clean your toothbrush properly by soaking it in mouthwash once a week. Equally, you should replace it every 3 months. The bacteria that collect of toothbrushes are not always harmless. If you or someone in your house has had the flu, for example, those bacteria can be airborne. As they are microscopic, it is not difficult for them to reach your toothbrush. If you put that toothbrush directly in your mouth, you run the risk of illness. While a few of these bacteria won’t hurt you as your body can usually fight them off, a build-up of them over time will become a problem. This means changing that toothbrush can save your health. The smile is the sunshine of the face, so making sure you have healthy teeth is important. Make sure you are checking your toothbrush regularly and cleaning it on a frequent basis to prevent the accumulation of bacteria. If you are a person who brushes quite heavily, you may want to consider changing your toothbrush more frequently than every 3 months. If the bristles look bent, it’s time to change!